Expletives flowed freely as another gust of wind throttled the canvas, throwing a support leg into the back of my head while I tried to wrestle the awning’s unwieldy form into submission. The now bird’s nest of guylines, stakes, and metal poles of death had me surrounded, and the prospects of surviving the ordeal looked grim. Sadly, I was only halfway through the setup of this canvas monstrosity, and I already wanted to burn it to the ground. It lacked any sort of support structure, the “legs” were non-adjustable sharp metal poles, and it was nearly impossible to set up alone. 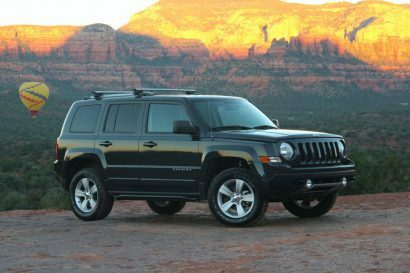 I eventually gave up and sat frustrated and exhausted in the Arizona sun. 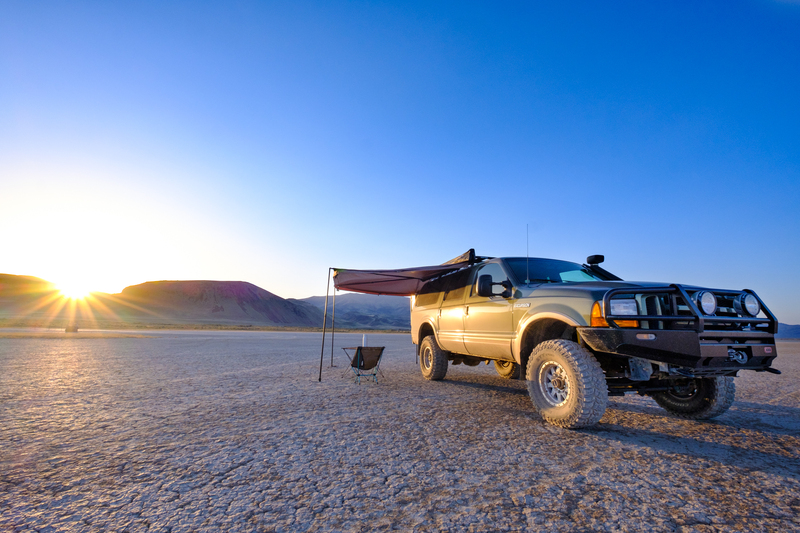 It made me appreciate the simplicity of the Batwing awning mounted to my own truck even more, and as I sat sweating in the heat, I yearned for its heavenly shade. 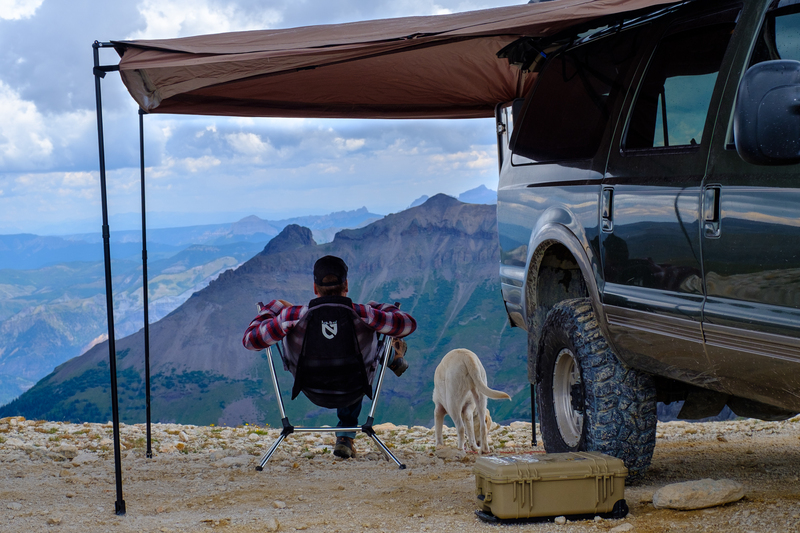 When the first 270-degree awnings were released, many of us got all starry-eyed and envisioned how they’d change our camping game. 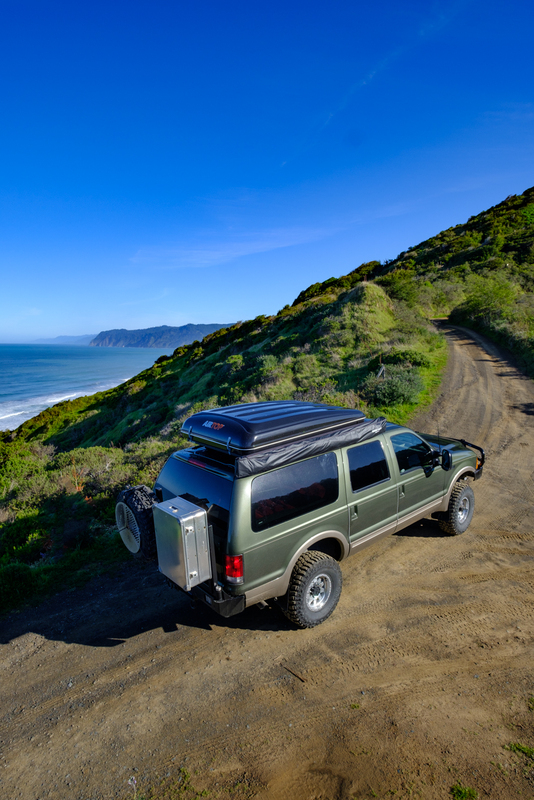 Protection from sun or rain could now be extended around the side and rear of the vehicle, expanding the living space significantly, and providing access to key cargo areas during all conditions. Unfortunately, this expansive coverage came at a cost. 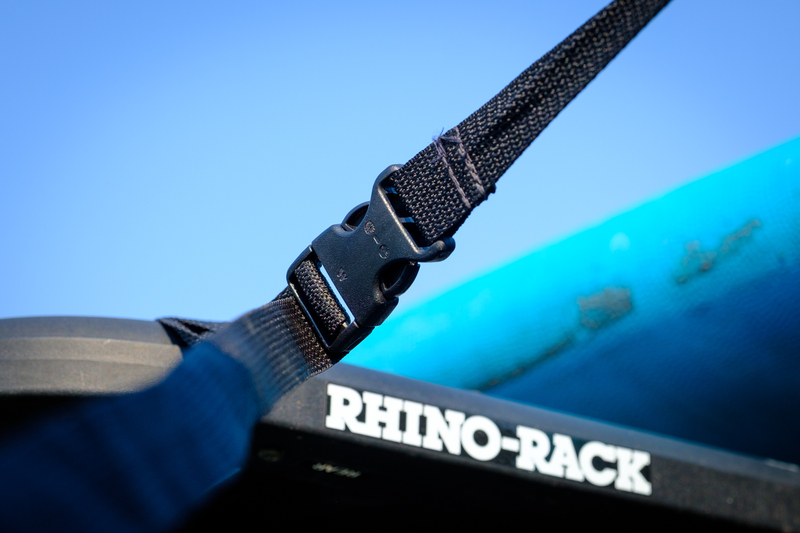 Upon their release, almost all of the 270 awnings cost upwards of $1,300 USD, and although more affordable options eventually appeared, they lacked the easy setup and quality of the more expensive units—at least until Rhino-Rack unveiled their new Batwing. At a retail price of just $699 USD, it is definitely a value proposition but touts many of the same features shared by its more expensive counterparts. 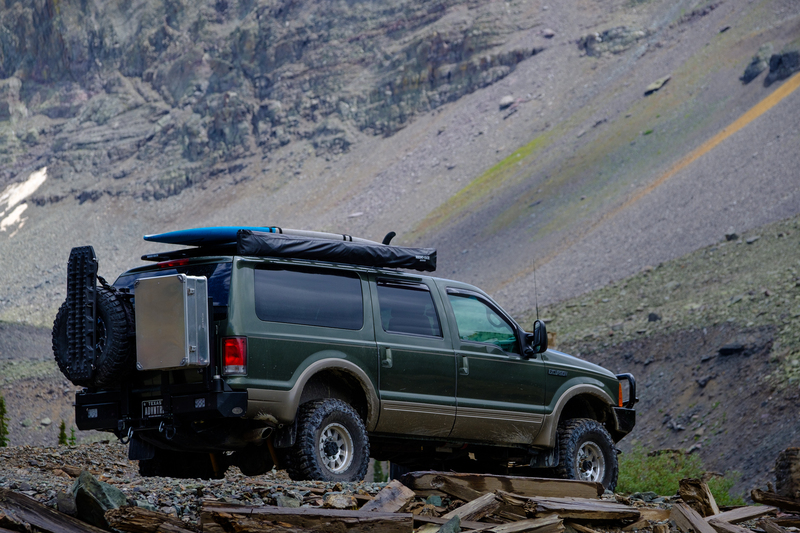 To see if it was as good as we all hoped, I decided to mount one up on our Ford Excursion and put it to the test of full-time living for several months. Here’s what we found out. 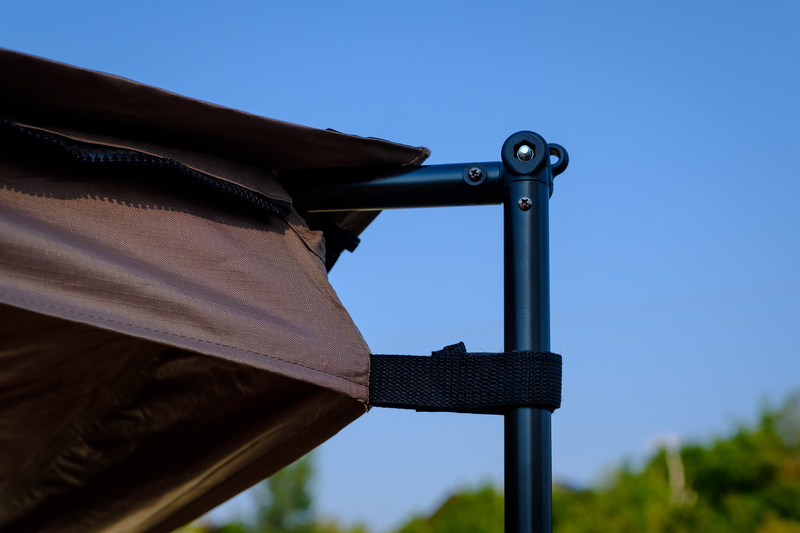 The biggest limitation of the last awning sold by Rhino-Rack and produced by Oz-Tent was easily the support poles. 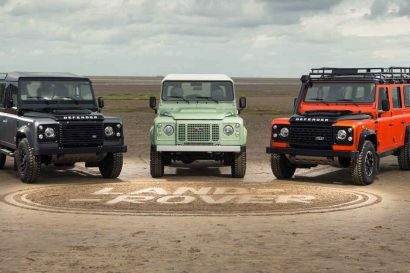 They needed to be stored independently inside the vehicle, and once set up they usually slipped out of their mounts unless firmly staked down with guylines. 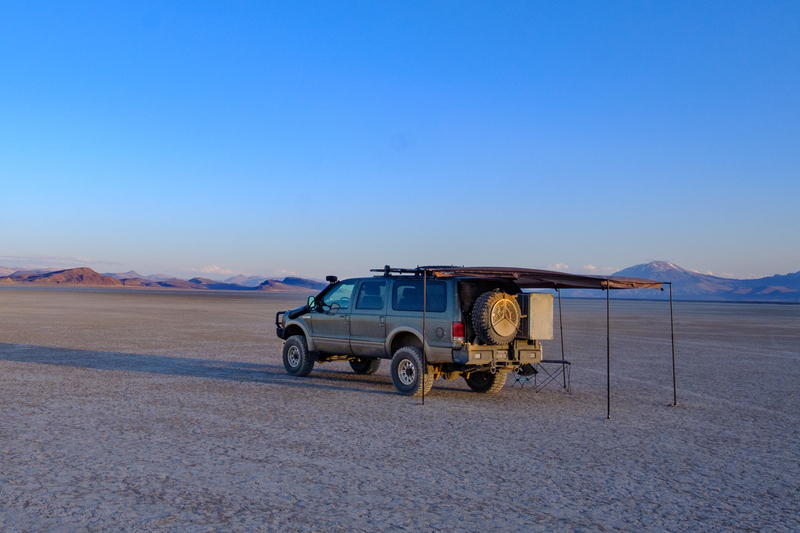 The result was an awning that needed to be staked down all the time, a nightmare in the desert. Fortunately, the Batwing changes all of that by switching to sturdier poles that are permanently attached and stored inside the bag. Setup is an absolute breeze. 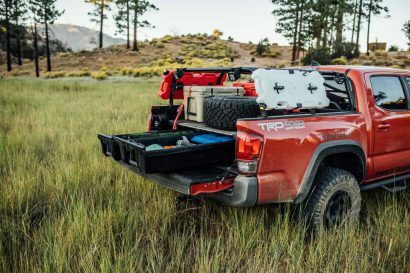 You simply unzip the bag, walk the awning around the back of the vehicle, and attach the tensioning buckle to your roof rack. Then, drop the legs, and you are done. The entire process takes less than a minute if stakes aren’t required. If conditions are less than favorable, you can use the stakes without being forced to use guylines. 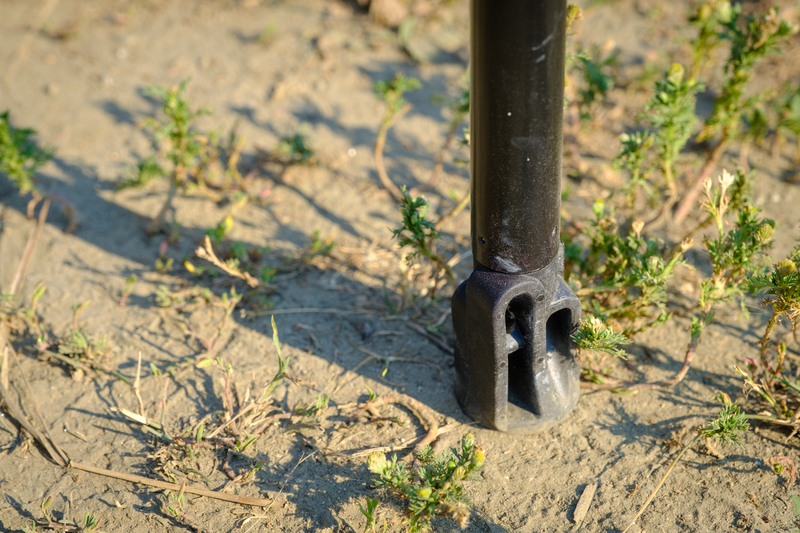 The feet on the poles have slots for you to cross stakes through, securing them to the ground without adding the troublesome cables for you to run into at night. Of course, Rhino-Rack still includes a full array of hi-vis orange lines for times when things get crazy, but we haven’t found them to be necessary. Once the awning was fully deployed, there were even more changes we loved. For example, the switch from dark green fabric, which tended to absorb and radiate heat, to a lighter tan alternative. This small alteration made a big difference in keeping us cool, and the 210D ripstop fabric carries an independently evaluated UV50+ rating, so you can feel confident that you’re getting real protection from the sun. 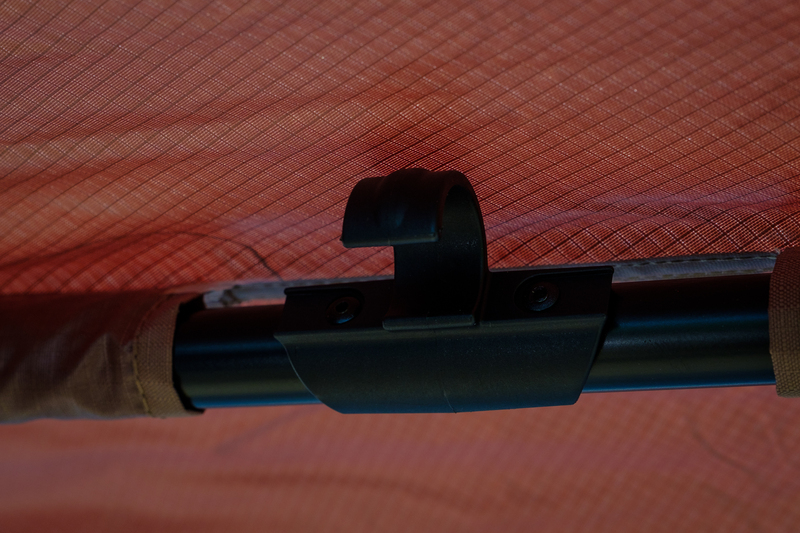 It is also water and mold resistant, which is a huge deal when you use the awning to escape rain as much as we do. In the photo above, we were hit by a surprise sleet storm, and shortly after were inundated by other people taking cover without an awning. We then stored it away wet for three weeks in hot conditions without opening it to dry. During the course of these 21 days, temperatures often reached the mid-1990s, but upon rolling the awning out, there wasn’t a spot of mold. Storing the Batwing was as easy as deploying it thanks to legs which can be adjusted and stowed in a single motion, and a cover that fits loosely enough to allow for some slop. We also loved that they secured the ends of the poles with magnets instead of plastic clips, eliminating the problem of mounts that become brittle and snap in the cold. 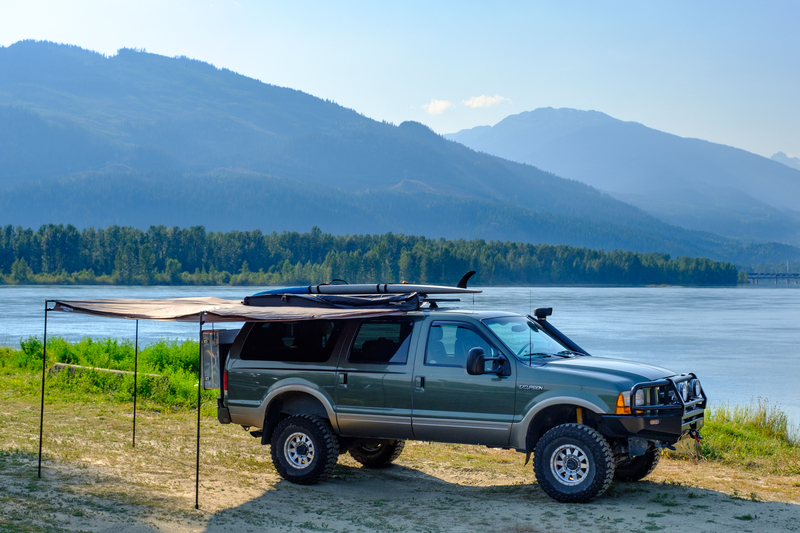 I’ll be honest, I tried pretty hard to come up with a complaint about the Batwing, but it’s really quite good, possibly the best 270 awning out there for the money. The only issue I found was more of an annoyance than a problem. That is the location of the storage bag for stakes and guylines. 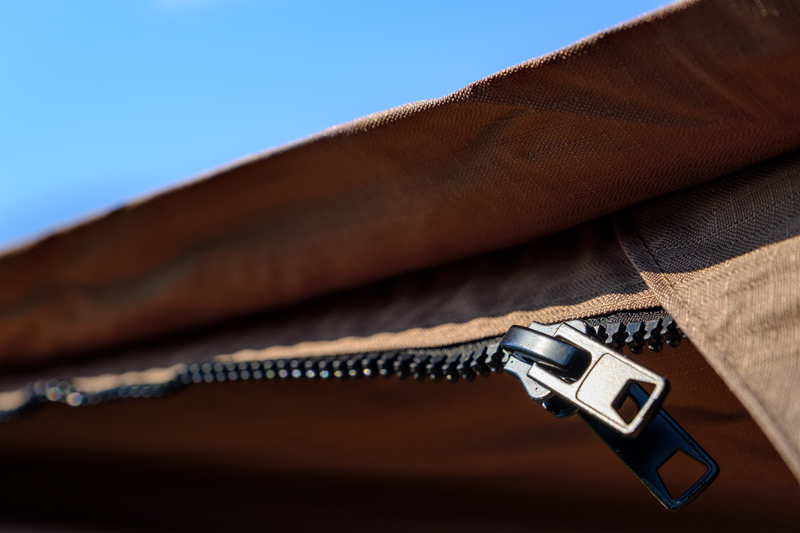 They tuck neatly inside the awning bag on top of everything else, but they must be removed before opening the Batwing, and put away after you stow it. Otherwise, they fold up and out of the way on top of the fabric, so when a wind crops up, you’ll need to break down the whole awning and stow it just to reach the bag of stakes. It seems easy enough to remember, but I’ve certainly forgotten it a few times when in a hurry to set up camp. I’ve used my fair share of 270 awnings over the past few years, and I have no hesitation in saying that the Batwing is one of my favorites. Sure, it can’t freestand like the Eezi-Awn Manta or the Alu-Cab Shadow, but at half the price I’m fine with that. It looks great, works like a charm, and doesn’t break the bank. What more could you ask for? 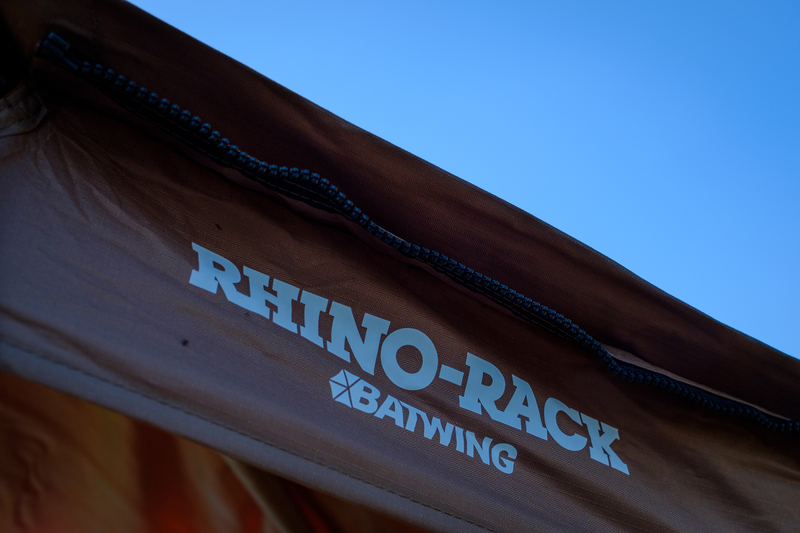 To learn more about the Batwing Awning, check out the Rhino Rack website here.